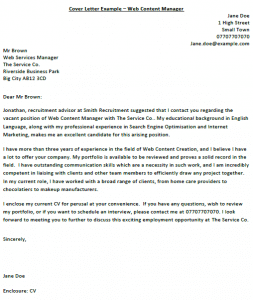 Use this cover letter example for Web Content Manager job applications. 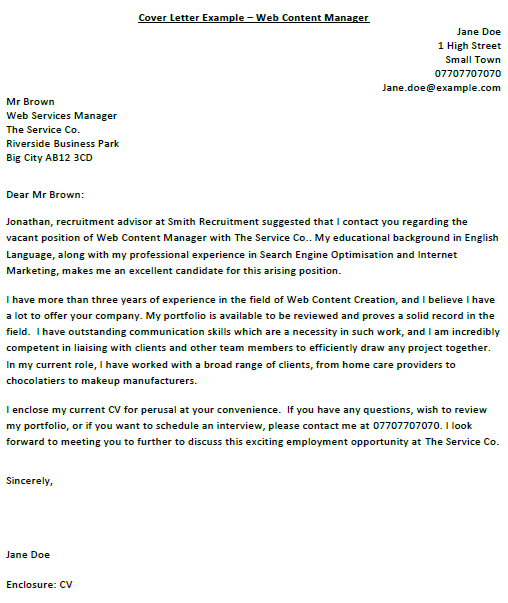 Jonathan, recruitment advisor at Smith Recruitment suggested that I contact you regarding the vacant position of Web Content Manager with The Service Co.. My educational background in English Language, along with my professional experience in Search Engine Optimisation and Internet Marketing, makes me an excellent candidate for this arising position. I have more than three years of experience in the field of Web Content Creation, and I believe I have a lot to offer your company. My portfolio is available to be reviewed and proves a solid record in the field. I have outstanding communication skills which are a necessity in such work, and I am incredibly competent in liaising with clients and other team members to efficiently draw any project together. In my current role, I have worked with a broad range of clients, from home care providers to chocolatiers to makeup manufacturers. I enclose my current CV for perusal at your convenience. If you have any questions, wish to review my portfolio, or if you want to schedule an interview, please contact me at 07707707070. I look forward to meeting you to further to discuss this exciting employment opportunity at The Service Co.